If I can say this (and I hope without sounding even the tiniest bit critical) this concern is a concern only of the mind. It is not real. Being worried or concerned about whether or not you are emotionally generous with yourself is purely a fascination of the mind. If you take in a deep breath, breathe out, and relax completely and check in with your body, you will find that you are being perfectly generous with yourself right now and, by extension, always—if you are present. Here is another way of considering the same “problem”. Being generous or being happy are not processes or states one has to do anything to activate. They are what what naturally and inevitably results when the various obscurations are removed. One of my teachers said that happiness (or peace) is the human’s natural state; and that the purpose of the mind is to obscure this (by creating problems of the sort you mention) in order to create suffering, so that we might be moved to work to wake up (once we become aware of this ‘unsatisfactoriness;). Spiritual work, he said, is not called ‘work’ for nothing. It’s called “checking out” and it happens every minute of every day, if we watch closely enough, and sometimes it can last for hours. Be grateful it doesn’t last your whole life as it does for many. Since starting to write this morning’s blog (now a separate post), an external event has captured my attention. Where Olivia and I live in Canberra we have a 10 Mb download, 1 Mb upload business connection to the Internet. This last week it has been extremely unreliable, with dialup speeds one moment (i.e., extremely slow), and the full 10 Mb download the next. Calling the technical support people has been an exercise in futility as I seems to know more about the technology than the alleged technical expert on the other end of the line—does this ever happen to you? For example, the last expert suggested that I needed to upgrade the modem that connects my system to the optical fibre network. I pointed out that the modem was supplied by their company as part of the service; and that it must be operating perfectly if it can supply 10 Mb one moment and 10 minutes later dialup speeds (< 0.5Mbps). It was quite clear he was in ‘salesman mode’ because he simply could not hear the logic of this assertion. A plumbing analogy is a decent one: if I have my kitchen tap turned on fully, and one minute there is full pressure and volume and then a minute later there’s only a dribble, it unlikely to be a tap problem. And if it was an internal modem (electrical) problem, this behaviour would not be exhibited either—in the computer world an electrical fault usually manifests as a complete shutdown. In another post I mentioned that I use a microphone and Apple’s Siri to dictate most of what I write here. One of the downsides of this mode of working is the requirement for a stable and fast Internet connection. And I can report that needing to reset the modem three times within five minutes is immensely disrupting to any train of thought. I decided to call the customer service number once more. The first thing I noticed with the customer service representative that I connected to was that I could not hear her, even though the volume is turned up on my phone. I asked her to adjust her microphone headset. As soon as she moved to the headset a loud crackling sound was heard over the line suggesting a loose cable somewhere. I asked whether she was in Canberra and she replied, “No, Auckland”. So imagine: a customer in Canberra using a local Canberra service ends up with a technical service representative in another country and in a different time zone, and whose technology does not actually allow our conversation to ensue. Once the headset problem was overcome sufficiently that a conversation could proceed, this is how it went. I relayed my experience with a previous customer service representative who was actually located in Canberra and with whom I had the long conversation last week I mentioned above. I noted that when we spoke on the Monday, he had agreed to call me back with a proposal for a new modem in two days time (so, Wednesday last week) and I was still waiting for the call back. Moreover, I mentioned that a system-generated feedback form had come to me from the parent company (iinet) via email as a result of our interaction, and which I had answered truthfully. As an aside, I mention it was one of those poorly designed questionnaires that offer five choices with qualitative points like “partially satisfied” or “very satisfied” as options. It might just be me, but one is either satisfied or dissatisfied, and that this state is not possible to modify (like pregnant, or unique). It is now a day later and I can reflect on the whole process. When I tried to contact iinet technical support section in the afternoon I did not get a representative in Auckland—this time I connected to Cape Town, South Africa. So it turns out that customer support for this company is handled by two different companies (at least) and in different time zones. And after much conversation with a senior supervisor of the Cape Town division it turns out that the technical support staff there cannot actually operate the software and/or hardware switches that are necessary to do the full testing of any individual’s service. What’s more, and worse in my view, is that these first-line customer representatives are not able to log a fault on behalf of the customer, either. No, you have to get past the gatekeepers and they have to contact the local technical help for you in order that you can then be transferred (in this case from Cape Town SA, to Civic, Canberra, a local call that literally has gone around the world) to speak with the local person. When I did get onto a lovely person who was based in Melbourne (a more local place than Cape Town, anyhow) she blithely informed me that yes, the servers had in fact been down all day. She also mentioned that she and her colleagues have been dealing with quite an “avalanche of customer complaints numbering over 7,000” to that point. I asked her why the company had not simply put an ‘outage notice’ on their websites, because everyone has an alternative way of connecting to the net these days via phone or an iPad. Her lockstep response was simply to apologise for the outage. I said, thank you, but I wasn’t asking for her apology and that what I was talking about was something that she could possibly pass up the line to a senior person for the next time this happens. It must have been the end of a long day for her because it wasn’t a suggestion she took happily. For me, the whole exercise is an example of extraordinary institutional stupidity, on at least two fronts. We know that most big companies are reluctant to admit any fault for fear of being sued or some other such legal remedy. But as the Cape Town senior representative put it “it might have been better to take the first bullet than dodge the next hundred”; a mixed metaphor to be true, and a questionable one, but nonetheless it does get the idea across. Had TransACT/iinet put up a notice on their sites indicating that there were outages or server problems, and requesting that customers check back in a few hours, they would have reduced their telephone traffic immensely, both locally and internationally. And customers like myself who have an alternative way of connecting to the net would have done so and not worried about it at all. But when the company’s front-line representatives tell you that the problem is likely to be at your end and then requiring you to engage in a lengthy testing process is egregious misdirection. Worse though: neither the Auckland customer service representatives nor the Cape Town customer service representatives who came online five hours later had any idea that there was in fact an outage at TransACT/iinet. When I asked the Canberra technical person (rep. #5, on this one day) why Cape Town has not been informed of the outages she simply was not able to answer. It was clear that no one in the customer representative local section had even considered the usefulness of this communication. Recall that all people being connected to the local representatives have to have gone through one of the overseas representatives first. It’s a crazy world but luckily the internet service is perfectly fine today. It must have been the recollection of drinking cognac with my teacher that brought this next idea to mind. Before I get to that, I want to make two comments about certain positions which are considered inviolable in spiritual work. One is the prohibition against intoxicants. But the fifth precept, which I have quoted before, says “I vow to abstain from intoxicants which cause carelessness” (my emphasis). Perhaps there is space there for the use of intoxicants where carelessness is absent—in other words, drinking (for example), with awareness. The second is the injunction to be vegetarian; positioned as a necessary lifestyle choice in order to ‘be spiritual’. It’s a pity that the Tibetans buddhists were not brought up to believe the same thing, as the majority of them eat meat whenever they can—yet somehow they seem to be just as aware (or more aware) than all the others who claim to be. I am reminded of one of the clichés of spiritual work: “Beware, your karma just ran over your dogma“. “Do you think he was doing the best he can?”, he asked. This hit me like a fist in the stomach. Of course the student was doing the best he could do. In that instant, I realised that everyone is—even those people whose behaviour we find personally appalling. There are so many factors in play here, which became clear to me in this instant, like upbringing, education, intelligence, mentoring, role models, etc., etc., etc. A significant chunk of my world shifted in that moment. Ever since, I have operated with the belief that everyone around me around me with whom I interact is actually doing the best they can. Watching things more closely since this thunderbolt, nothing that I have experienced has weakened my belief in the accuracy of this point of view. Could this be the seeds of compassion? One final heuristic I have followed when decisions need to be made is this: what is the best possible outcome for all concerned? I will explore this idea in a future post. I’d be interested in a post that expands the ‘mindfulness’ into ‘taking care’ – it seems the latter requires the same attention but because it has an emotional sound to it, then its less hip. Your post indicates a lot of care and so seems richer than just mindfulness. In any discussion on something as ineffable as mindfulness we must keep in mind the following dictum: words are only “the fingers pointing to the Moon” as the Zen saying has it: mindfulness cannot be experienced by writing about it or talking about it and, further, recall the famous Korzybski saying, “The map is not the territory”. On this latter point I will write another post another time, wherein the core idea that I want to introduce in connection with this saying is ‘motivated perspective’. More on that later, but a hint now is that any mapmaker has a purpose in mind and this is the reason why drainage maps will look different to cadastral maps even though they may address the same spatial territory. In other words, are there are no neutral maps and that applies to perspectives as well. Before digging into this more deeply, it seems to me that, depending on the way ‘taking care’ is experienced, these fingers could be pointing to the same Moon. If one is aware that one is taking care rather than simply being absorbed in the process of taking care of self then from my experience this is identical with mindfulness. To put it more formally, mindfulness is a second order phenomenon: awareness comes first and then the experience that one is aware of being aware is where mindfulness can be found. If one is taking care and one is aware that one is taking care, I cannot see any significant difference in these activities. And recall the quote that I linked you to the other day: the critical part of the quote is the the assertion that “mindfulness is an activity, not a thought form. One of the obscurations of my own mind is that I will experience immense frustration in my physical body when any particular technology fails to deliver what its designer intended. It is fascinating to watch this process arrive in the body (though not as interesting nor amusing for those around me), and I am reminded of the conversation I had with a wonderful teacher more than 10 years ago who spoke about earlier time the Rishis wrote about, when “the Great Beings walked the Earth.” The teacher and I had been drinking an extremely expensive cognac (‘Hine‘) for some time at this point. I mused aloud: “I am really looking forward to the time when I’m not angry all the time” I said. “When some people get angry, they stay angry for hours, or weeks, or their whole lives” he said. This comment struck me with the force of a revelation. Immediately I decided to be one of those who become aware of anger arising in the body, who have the presence of mind (the mindfulness we are considering) to pivot and choose to move to a new state within two or three heartbeats. I am still waiting for that day, but can honestly report that anger it is upon me less frequently, and less intensely, and definitely more briefly these days. Of course, to really test the veracity of this assertion, you would have to speak to the people closest to me. I’m sitting in my bed in my house and slowly drinking coffee number two. Those who know me will know of my assertion that coffee number two is the best coffee of the day; certainly it tastes the best and perhaps that’s because the first coffee’s caffeine has kicked in and awareness has definitely opened! Well, at least to some extent. Dr Richard Alpert, Ph.D., became Ram Das in a story which is partly told in the book with the title, “Be here now“. I have linked to a review site deliberately so that if you’re interested you might care to read the extraordinary range of responses this book has triggered over the very long time it has been around. This range of responses is part of the reason why “be here now” actually needs to be asserted. Think about it for a moment—where else can you be? Yet, without a doubt, the evidence to support the need for this assertion is literally around you every moment of every day: most people’s bodies are physically present, and they are not. I have canvassed some of the reasons why this might be the case in an earlier post but it is another aspect I want to talk about today, triggered by reading a short article. It was found on a site called “inspiyr.com“; full of interesting ideas about ‘how to live better’. The article that caught my attention is THIS one; and it’s about ‘how to release the inner critic and uncover your heart’s desire’. It’s short. How does the voice of the ‘inner critic’ begin, anyhow? That it exists is something that is reflected starkly to me every time I present a relaxation session or a meditation session at a workshop. The overwhelming reports back is ‘I can’t do X or Y because all I can hear is the voice in my head’. For example, one of the beginning exercises is breath counting done in a particular way. Each breath out is given a number, starting with the number one. The instruction is, ‘as soon as you find a thought distracting you from holding your awareness in the sensation of breathing and the incrementing of the numbers, go back to 1’. Most people do not get past three. The next exercise done is also breath counting but the new instructions are ‘when you get distracted by thought you simply note it then come back to the breathing count’. For the vast majority this is a much easier exercise, and it also shows a new practitioner just how many thoughts are generated in the mind every minute. Now, it’s possible to lose track of the count in this second exercise as well, but if you do, the instruction is simply to go back to the last number you’re certain you can remember accurately. One of the lovely aspects of this latter exercise is that one’s awareness opens up into a larger field where thoughts can be seen to be popping up and disappearing (and this can be the first experience of impermanence). The breath counting awareness is part of the larger field. A Tibetan teacher I worked with once claimed that there are 60 new thoughts generated every second. That is a lot of thoughts! And it is true that in the beginning of one’s practice it’s almost alarming to see just how many thoughts come and go while you’re simply practising sitting or lying (or standing) motionless. If this is at all disturbing in your practise, my recommendation is simply to relax even more, and when you get distracted, gently bring the awareness back to the sensation of breathing. Becoming more and more aware of the sensations of breathing always brings you back into the present. Of course, if the voice in the head is a loud one, this can require some effort! As a practitioner of body work I have spent many hours listening to people tell their stories. One memorable day a woman sat on the couch in the clinic and talk non-stop for about 47 minutes. It felt important to me to encourage her to tell her story though if I were asked ‘why?’ in the moment I would not have been able to answer with any sensible or rational perspective. When she appeared to be flagging I would make encouraging noises like “uh huh”, and “go on”. Eventually she stopped. She looked at me with palpable gratitude beaming from her whole body and she said “Thank you; that’s the first time that anyone has ever listened to me tell the whole story of my problems”. She paused. Then she looked down into space and said, “I’ve just realised this has absolutely nothing to do with how I’m feeling right now”. There are so many interesting things here. One is the mind’s deep, intractable need to tell its story; ‘this is me, this is me…’ it says, endlessly. We live on a planet of nearly 7,000,000,000 people, and all of them are certain they are the centre of the universe. Then there is the dimension of the practitioner patient interaction which is normally called catharsis. In my view this is an incredibly useful process potentially, but only if it yields the ‘jump’ in awareness that this patient had in this moment. To end today’s short post, I want to share with you a five minute video which epitomises all of what I consider to be useful in the interaction between a psychiatrist and a patient. It’s 12.5Mb, so you might want to be on a reasonable fast network before viewing. Number 17? This is a completely made up number and has no significance whatsoever! Today I want to talk about a true productivity tool called the Samson “Go Mic“. For those who are not familiar with that term, ‘mic’ spelled this way is short for ‘microphone’. Perhaps you will have heard of the Dave Wardman “90 day blog challenge”—if it were not for the capacity to dictate and have that automatically transcribed into text, there is no way I could have written so much in such a short period of time (along with all the other things I need to do as we close the ANU). I have reported elsewhere that I have tried all of the modern Mac-based dictation systems. Without exception, all are hopeless, requiring more time to correct the errors produced than it does to type from scratch at around 25–30 words per minute, albeit with errors. Once, down at the Bermagui farm I used to own with my friend Bill Giles, and accompanied by a powerful laptop, I tried to teach one of these programs how I speak, even reading long excerpts from my books to help the process. No joy. I even spent another two-week period once trying to learn how to type properly but for some reason my old hand and finger habits revert as soon as I leave the typing program. So, enter dictation. Anyone can dictate of course and perhaps a solution might be to simply send the sound files over to a transcription service in India. But, impatient as I am, I want to be able to clean up what ever I dictate, once converted to the actual words that will appear in emails or blogs. As well (and I blame this on living more or less in the present moment, and not on ‘old timer’s disease’) come tomorrow or the next day I probably won’t remember exactly what was that I was trying to say at the time; no, it has to be now (there is only now!). The Mac OS has a very good facility built in, called Dictation. The only drawback is that one needs to be connected to the Internet in order to use it. Accessed from the Dictation and Speech icon (within System Preferences), the default setup is to press the Fn key twice. A cute old-fashioned microphone icon appears, and you talk. You press the return key to end that dictation element; Siri limits you to a 30″ burst of voice (she rendered “30 second” as “32nd”—audibly, these are identical, so no foul). ‘Dictation’ does not yet understand logic and context but I have high hopes that she will in time. If you have a good Internet connection and the voice input is clear, the accuracy of the returned text is excellent. The background technology is Siri, the same technology that first appeared in the iPhone iOS. Apple claims that Siri does learn but because one’s corrections are not sent back to Cupertino, this seems extremely unlikely to me. Regarding accuracy: the more technical the terms (like in the previous two sentences) the more accurate the returned text is. The three previous sentences were 100% accurate in fact. Siri struggles with words like fascia, although because I pronounced it the American intonation this time, she got it right. The deeper problem is sibilance: most technology has real difficulties distinguishing between F for Foxtrot and S for Sierra. In fact, because of listeners’ almost 100% non-comprehension of the old website (www.pandf.com.au) URL over the phone, I had to learn the radio alphabet in order to make the letter “F” clear—the bandwidth on a standard telephone is so narrow that no one can hear the difference between F for Foxtrot and S for Sierra. Enter the Samson Go Mic. 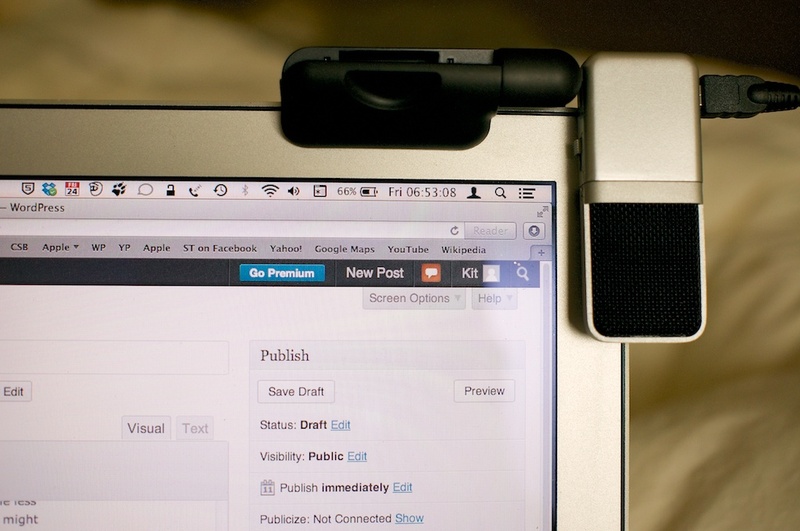 This tiny microphone clips onto the top of the MacBook Air. It came with a ridiculously long USB cable (almost 2m!) but Olivia found me a much shorter one which fits perfectly between the right-hand USB port and the Samson. Clipping and plugging in the Samson onto the Air automatically connects it to the Dictation software. The reason that this is so exciting to me is that the already excellent accuracy is increased significantly by using this decent microphone. As well, I will be able to use the Samson for the Voice Over tool in Final Cut Pro; up until now I have avoided doing voice overs on the road because the voice quality of the inbuilt Mac microphone on both laptops is simply not up to that task. A technical note: the Samson does not record at 48KHz, but rather the CD quality 44.1KHz, but Final Cut Pro will render this audio up to its preferred 48KHz in a second or two, so that’s no problem at all. And I have just thought of another use: I can use the Samson on the road to record my relaxation scripts as well, directly into the computer. I will probably use the Quicktime sound recording facility, though I have not yet explored that, and there may well be a better way. There is: I just downloaded the truly excellent Audacity freeware; it not only has an interface that I recognise instantly (similar to Final Cut Pro and sound recording programs, with wave forms and all editing facilities) but it also allows output in any file format, so perfect for MP3s. We are surrounded by technology but I make it a rule to only uptake technology that makes a discernible difference to me in ordinary daily life. The Samson Go Mic fits this criterion. Everyone knows how words and concepts can complicate and obscure experience. 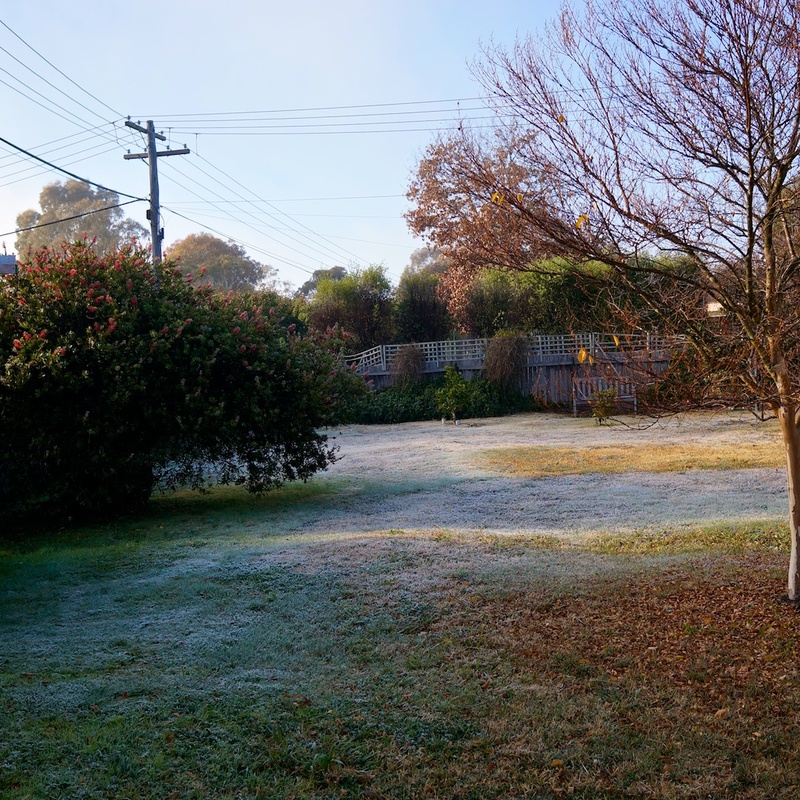 Today’s short post is an attempt to describe a few minutes in my life this morning. The idea of richness is about smells and perception of temperatures and awareness of space. As an aside, I am experimenting with square format images at the moment and have three to share with you today. I had left my Crumpler bag in Olivia’s house last night—and the Samson Go Mic was inside the bag! So, in bare feet, I opened my back door and this was the view I saw immediately and what I felt immediately. En route to Olivia’s, I walked across the frosty grass: intense. On returning and setting up the dictation system, I made what is always for me the best coffee: the second coffee of the morning. And the extra caffeine had the effect of making me aware that the body needed to go to the toilet: ah, the joys of the squat toilet! Getting onto the support and simply lowering the body into the full squat position is a complex suite of sensations. I love this feeling. And I realised today that, in fact, I have not mentioned what I consider to be the most profound aspect of the squat toilet in the earlier post: once one has adopted the squatting position on the support, and relaxed, one simply breathes the process of excretion. It is a beautiful, rich, and incredibly relaxing sensation. Why is it that this simple pleasure not celebrated? And I reflected on the process of how what was once a part of the body only seconds before becomes ‘waste‘. And when at home it is my morning habit to light a small piece of “Arjuna” sandalwood incense from Indonesia, given to me by my dear friend Cherie. I break off a small piece and use the wonderfully named “Redheads” large kitchen match to ignite the end and I extinguish the flame by gently waving the piece of incense from side to side. As I light the incense and become aware of its extraordinary smell I always think of Cherie. Nothing ties a memory more strongly in the body than the sense of smell that is associated with it. I experience gratitude. Watching the smoke rise in infinitely varying patterns from the surface of the incense is fascinating; the odour intoxicating. The edge of the squat toilet can be seen in the background. The glass kettle is treasured: the patterns in the water as it heats, then boils, is likewise fascinating. 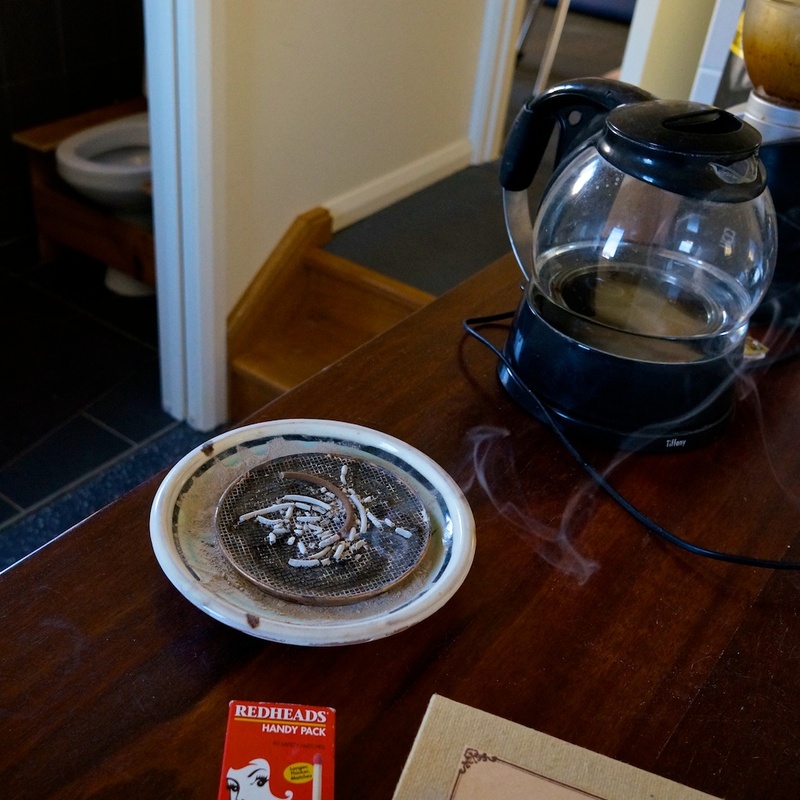 But it is the patterns of the smoke leaving the burning end of incense which hold the most interest for me: the air in the kitchen part of my little house is extremely cold because the room is unheated and, as a result, the smoke rises rapidly. I am intensely aware of the cold lino under my feet and the sense of the exact size and volume of the space I am standing in. 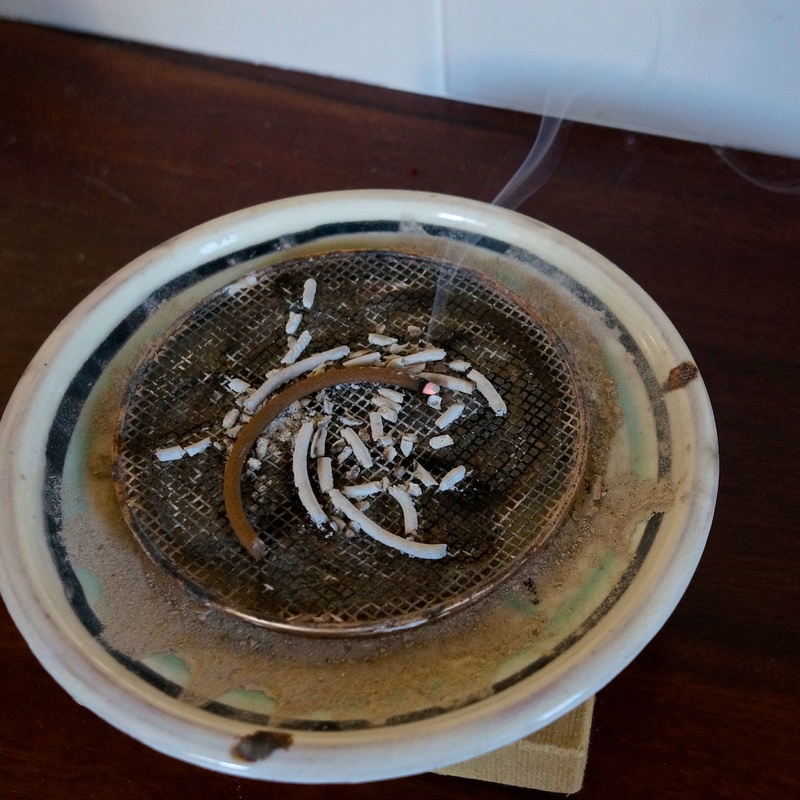 I look at the incense residue under the coil burner and reflect on how many mornings like these have led to its creation. I feel deep gratitude for the experience of being alive. When I went to open my blog this morning, I noticed that it was extremely slow to load and I thought perhaps it was the recent installation of an RSS reader (NetNewsWire) that had caused problems. But no: all the other WordPress sites that I use were also slow or down or had lost their formatting. Coincidentally, as I subscribe to AskDaveTaylor‘s excellent tech site, there is an article there today on how to back up a WordPress blog—naturally I am very interested! The article prompted me to have a few thoughts on how I organise my data in general and how I make sure that nothing ever gets lost. Of course, today I have to admit that I have not backed up my blog yet but now that are 43 or 44 posts, clearly this needs to be done. I have been using personal computers since the very earliest days and as an ex-academic I was one of the first Internet users as well. Perhaps paradoxically this makes me less confident of the reliability of the cloud and cloud-based computer and then you might expect. I am completely familiar with the story of how the Internet began as a DARPA project for distributed information storage. I have a local copy of all of my emails and it is pretty much up to date. I make a clone of my MacBook Air every couple of weeks also and make sure that it’s bootable—this way if the Air’s system gets corrupted irrevocably in some way, or suffers a logic board failure, I can simply attach that boot clone to a brand-new Macintosh and set it up in 20 minutes, and that includes all of my installed software as well. Now, as many of you know, some software requires deactivation and activation on a new machine but in the case of a massive failure these are small problem that can be coped with fairly easily. I have even had success with Adobe’s killer software protection by simply calling a number that led to a call centre in India, with someone was extremely helpful on the end of the line who performed the required reset of the “legitimate activations” number. I have written elsewhere of two other strategies that I use on a daily basis: one is an excellent software called ChronoSync and the other is the syncing of 1Password‘s encrypted data base via DropBox. This takes another base up-to-date between my two machines and I only ever need to create and enter password once. I use a minimum 15 character alphanumeric randomly generated password for all sites. I have described how I use ChronoSync elsewhere but the interaction between the two computers and the clone I will explore here. First, it’s necessary to understand that I use ChronoSync to make sure that my two computers’ documents folders are perfectly synced at all times. In the event of a catastrophic failure of either machine I can install my software and all other folders from the clone and then sync the new machine to the still-working computer, meaning that my documents folder will be completely up-to-date. I use a Quad-core 15″ Mac as my main video and image editing machine and for making YouTube clips and our products. The Air is mostly used for email and anything to do with browsing the net, and for all writing work. Whenever I finish working on one machine and move to the other (like after fa full day’s editing), I use ChronoSync to make sure the document folders are identical—ChronoSync is such an intelligent piece of software that this process only takes 30 seconds or so. So we come to the WordPress blog the as the only as yet un-backed up writing I have been doing for the last month or so. I am confident that the loss of formatting is only a temporary glitch in the WordPress environment, but this remains to be tested. Ah: I just tested this and in fact formatting has returned to the blog, so I will now use Dave Taylor’s advice and use WordPress’s own backup feature to download a full copy of all text (including formatting) to the Air’s documents folder (whereupon the next time I sync with the MBP, two copies will exist, and when I make the next clone, three). All this may seem like total overkill for the ephemera that is a blog. For me, the principle is as much philosophical as anything else: I simply don’t want to expend any effort whatsoever, if the results of this effort don’t have a certain permanence. Of course, this will fail the fifty-year test but most things do! So I can attest that the WordPress export function is extremely economical, space-wise: a full export of the blog only needed about 500 kB and that included content, formatting, and comments. Kudos WordPress! I also use the Apple Mac TimeMachine utility for backing up occasionally. One of the reasons for using this in addition to the other methods described above is the Time Machine uniquely will allow you to go back into your own writing and creating history, as finely as your backup timing allows (the default is hourly). On one occasion I found this useful to retrieve an earlier version of a document when I had been a bit hasty in creating a new one. I do not have TimeMachine operating constantly though because I find it slows the machine performance down. And I always make a TimeMachine backup on external drive once again, for data security. Unlike most people who use TimeMachine via their wi-fi system, I use wired HDDs; they are so much faster and using Airport (Mac’s wi-fi) slows the network down too much, at least until the first backup is done (which can take more than a day). Wired backup takes a fraction of the time. In the creation of the new book Stretching Mindfully I will be using DropBox (a cloud-based system) for regular backing up. But, because text takes so little space, and I have all of the important images of the new book backed up on A RAID 1 array (which I’ll get to in a moment) I think that will be sufficient. One of the truisms of the tech world is that it is not a question of if a hard drive will fail, it is only ever question of when. In the last 10 years I have lost two FireWire 800 drives that simply died and the data was unable to be recovered from the platter. But because I shoot in the raw format (even if I also have JPEGs enabled), and because I always store the raw files on a second drive, and as they come out of the camera) I was able to recover all of these images. Last week one of my 3 TB LaCie external hard disk drives had a bit of a conniption. As I was editing video, and the capture scratch folder is on this massive drive, I became concerned because although I keep the raw video files (AVCHD format) on yet another drive, to reconstruct the full footage would be hundreds of hours of work. Accordingly, and for the first time, I bought a LaCie RAID array and I have set that up in what’s called the “mirror” configuration. The RAID contains two drives and they can be set up as either striped or mirrored. “Striped” means that the data throughput is phenomenally fast because it is split over the two drives and both drives are recording simultaneously. The system keeps track of where the different data packets end up. But because this RAID uses Thunderbolt technology it is already blazingly fast. I use the mirror option; as the name suggests the second drive simply mirrors the first, automatically making a perfect copy of whatever is written to the first drive, and a utility monitors drive ‘health’. If one of the drives is reporting some kind of error to the utility, a warning will come off on my desktop. I then have the option to copy from the good drive to another drive and order a replacement drive from LaCie. When the new hot-swappable drive arrives, I will simply withdraw the faulty one, insert the new one, and the utility will immediately back up the good drive’s data to the new drive. In the modern era I believe this is the bare minimum for any important data—and please tell me, what data do you have that is not important to you? My final data protection strategy is to compose my blog in TextEdit, save it into the documents folder, and then copy the content into the WordPress environment. Overkill probably, but in all the years of working with computers I have never lost anything important—so far. Today there is a tremendous amount of writing about mindfulness, or Sati. The article that I have linked to is far and away the best that I have ever read on the subject. For our purposes today, the ‘take-home’ message from this brilliant article is that mindfulness is an activity, and not a thought process. Now, if you are like most of us reading this, you will interact with the world through a model of the world, rather than through reality, but this will not be your experience: you will believe that your model is reality. One of my teachers told me the reason why we buffer reality in this way is that the direct experience of reality is simply too intense for most people. For most of us, the model we use to interact with the world via is the world of language and symbols. As the great Korzybski once famously said, “The map is not the territory”. No model of reality can be Reality (Anthony Wilden’s excellent distinction between ‘small r’ and ‘big R’ reality). I want to go further with this another time, but for today, will say just this: the assertion that Reality exists independently of us and the same for everyone (though many ways of talking about it, and representing it), is just that: an assertion. It is an article of faith. I want to gloss over 10,000 extremely interesting things to get to the point of today’s post. Stretching is an activity, like mindfulness. By definition, stretching/moving can only happen in the present. Again, people can hear this and simply not get the profundity in the assertion. If you bring full awareness to the activity of stretching you cannot be thinking. Thinking occurs in the immediate past or future or long distant past distant future only, never in the present. Of course, if you are like most people, your thoughts are your reality. One of the deep purposes of meditation in all its forms is to show you that this simply is not accurate. Because we are so used to interacting with the world via a model of it, some people have never had the experience I’m talking about. The whole point of using the body as the basis of meditation is simply that the body exists in the unending present. Hence, when we become aware of the breath or sensations inside the body, we are present. There are no thoughts there, only sensations. If one brings mindfulness to the activity of stretching then there is only the complex suite of sensations in the moment. As well, when the organism feels threatened (which is always the case in a really strong stretch like side splits or front splits), your reflexive habits may manifest. For example, one of our teachers in the advanced class speaks to his training partner quite aggressively (but completely unconsciously) when he’s in a strong stretch. If you are mindful of the activity, mindfulness will notice this tone and this tension and a moment of insight will occur. Mindfulness is nothing more than being openly aware (pre-thought aware; extremely rare for we western folk) of what’s happening in the present and seeing the thought forms and experiencing the sensations all at the same time but not being connected to them. When I say “not being connected to them” I am describing non-attachment or Vairagya. This is not detachment! So now to the deep reason for the book title, Stretching Mindfully. Simply, the body is the primary instrument of insight. The standard opening instruction in all meditation retreats is, “Bring your attention to the breath.” As soon as you do this, there is only sensations—until the awareness is captured by a thought and taken away from the present. Being aware of this capturing process is mindfulness. The sensations of stretching are, for most people, even stronger than the sensations of breathing. My experience of working with many people on meditation retreats is that connecting the meditator to the body via stretching and movement brings the person into the present and keeps them in the present extremely effectively. As well, gaining a closer contact and understanding of the physical structure you live in will enhance the sensations of breathing, digestion, and existing very, very effectively. Enhancement of the sensations of being alive is another way of helping us stay in the present. About five years ago, Patrick Kearney came to me in the Monkey Gym to talk to me about the possibility of adding bodywork modules to his meditation retreats. 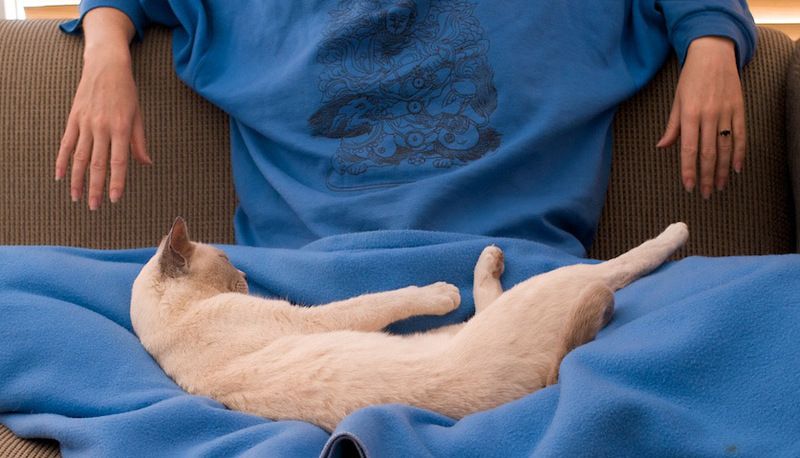 Patrick is a Pali scholar and a wandering dharma teacher, who loves from dana exclusively. We have now co-presented three week-to-10-days long meditation retreats over the last three years, at the magnificent Govinda Valley Retreat Centre. The many wonderful experiences on these retreats, coupled with what happens on our Stretch Therapist and Stretch Teacher workshops, tells me that we are onto something here. Simply concentrating on working on the body, coupled with sitting practice, lying practice, and walking practice, and bringing awareness to all of these activities fosters profound change. Our last workshop together was entitled, The four postures of meditation. Traditionally, these are standing, sitting, reclining and walking. These are the four postures of daily life. As our goal is to bring awareness to all aspects of our experience of living, on these retreats we practice mindfulness in each of these postures. Now, on all meditation retreats the degree of mindfulness that is brought to all the different activities that one engages in varies tremendously. Patrick and I were talking one day about how people serve themselves food and how they sit down and how they eat. It was clear that the degree of mindfulness in these other daily activities (compared to when the retreatants were sitting or stretching) was very different. Accordingly, following the lying meditation session (done before each lunch time) I asked Patrick to give a short talk on mindfulness while eating to the group. The difference in the experience of eating together was profound. And a number of retreatants commented (after silence was lifted at the end of the retreat) on how being mindful of the entire process of eating affected them. Mindfulness is an activity and in time may become a habit—and the more often we engage in it, the more often it becomes our ordinary way of being in the world.